Eggless Mozzarella Sticks are one of my kid’s favorite appetizer. 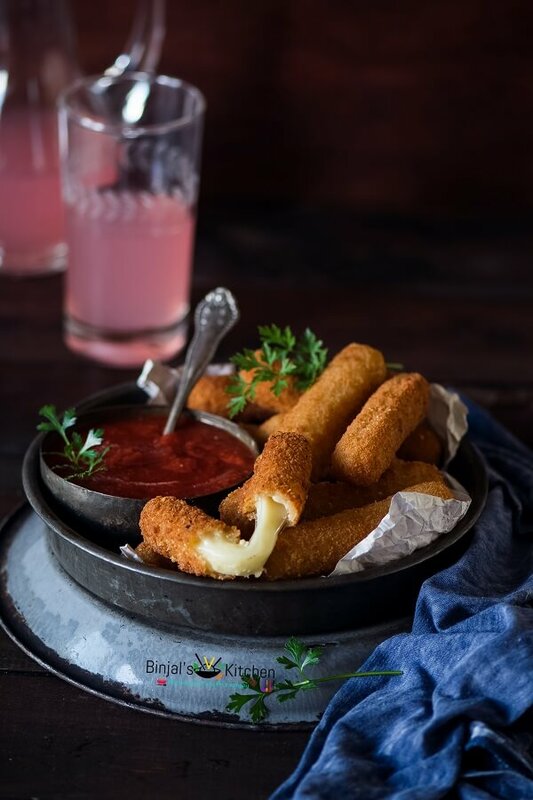 Eggless Mozzarella Sticks is cheesy inside and the crispy golden outer crust. Eggless Mozzarella Sticks may be served with tomato or marinara sauce. Though Mozzarella cheese is Italian, Mozzarella Sticks are unheard of in traditional Italian cuisine. In the US, this deep-fried snack is often served at restaurants as an appetizer. This is one of my all-time favorite appetizers to enjoy. There’s just something about the little gems of fried, cheesy deliciousness that make my mouth water in anticipation. Ever since I was young, I have always loved pulling and stretching the mozzarella sticks apart only to dunk them in marinara sauce. I had absolutely no idea how quickly my kids could chow down an entire bag of string cheese! Seriously… I made them all up in one batch of Eggless Mozzarella Sticks and they were gone… like that! If you’re preparing these Eggless Mozzarella Sticks in advance, you can freeze them for a few hours before frying. You’d need to keep them in the fryer a little bit longer, but freezing the cheese sticks helps to keep the breadcrumbs in place so you don’t end up with cheese oozing out… which is a possibility if you don’t have good breadcrumb coverage. 1. Take a bowl; add all-purpose flour, salt, garlic powder, black pepper powder, Italian seasoning, required water and make batter without any lumps and keep aside. 2. Now take regular Mozzarella Sticks and cut into finger sized sticks or if you have string cheese sticks then cut into half. 3. Take a mozzarella cheese stick dip in the batter mixture and then coat in the bread crumb. 4. Again use the same process, dip in batter mixture and then coat in bread crumb and keep aside. 5. Use the same method (step 3 and 4) for remaining sticks and then all breaded sticks keep in fridge for 1-2 hours. 6. After 1-2 hours, heat the oil in deep pan; when the oil hot enough fry them till golden brown. 7. Remove the fried bread sticks on paper towel and transfer to the plate, sprinkle some Italian seasoning and serve with tomato sauce. • If you don’t want to fry them, place the sticks on baking tray and spry the little oil and bake sticks for 5-6 minutes in preheated oven (350° Fahrenheit). Take a bowl; add all-purpose flour, salt, garlic powder, black pepper powder, Italian seasoning, required water and make batter without any lumps and keep aside. Now take regular Mozzarella Sticks and cut into finger sized sticks or if you have string cheese sticks then cut into half. Take a mozzarella cheese stick dip in the batter mixture and then coat in the bread crumb. Again use the same process, dip in batter mixture and then coat in bread crumb and keep aside. Use the same method (step 3 and 4) for remaining sticks and then all breaded sticks keep in fridge for 1-2 hours. After 1-2 hours, heat the oil in deep pan; when the oil hot enough fry them till golden brown. Remove the fried bread sticks on paper towel and transfer to the plate, sprinkle some Italian seasoning and serve with tomato sauce. really great and very yammy ! do we have to use Italian seasoning?? You can use cornflakes crumbs or oat crumbs instead of bread crumbs! I haven’t cooked that much. So forgive me if this is a dumb question but do we not have to mix water for the batter? Or is it a dry mix? No Problem Meerchy, its not a dump question. Yes, we do have to add water. It is mentioned in the recipe too. But it doesn’t say how much.